France, 2012, 102 minutes, Colour. Vincent Lindon, Soko, Chiara Mastroianni. Doctor Jean- Martin Charcot was a pioneer in, possibly the founder of studies in neurology for patients suffering symptoms of hysteria. His main client was a teenage maid, Augustine, who was subject to seizures. He treated her and decided that he would present her as a case study for the French Academy. His demonstration was accepted and he was congratulated. The film introduces Augustine and her work in an affluent house, serving meals to guests, but having a seizure during her work and the consternation amongst the guests. She goes to Doctor Charcot who becomes very interested in her case, relying on his associates, and the capacities for inducing hypnosis in one of his assistants. There are many scenes of the film of her having seizures, some of them part of her experience, others induced. Ultimately, the doctor decides that he should present her as a case study to the French Academy and a backup for his theories and neurological developments. There is some background story to the film, the tension in his marriage and the support of his wife as well as her feeling distant as well as his unprofessional sexual encounter with his client. He is played by Vincent Lindon, his wife by Chiara Mastroianni. Augustine herself is played by the popular French singer Soko. There is a feminine, even feminist, sympathy and sensibility in the film, written and directed by Alice Winocor. 1. The historical background of this story? The research and work of Doctor Charcot? His interest in neurology, in hysteria, in seizures, in hypnosis? Augustin as his case study for the French Academy? 2. The style of the film, the visuals, the mansion and the meals, the kitchen? The streets? The transition to Doctor Charcot’s office? The scenes at his home? The Academy and its meetings? The musical score? 3. 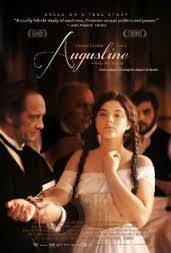 Augustine, her age, working as a maid, serving the meals, in the kitchen, her collapse, her seizure, the family reaction? Her inexperience? Going to Doctor Charcot? The sessions, the treatment, his questioning, the seizures, induced seizures, hypnosis? The effect on her? The effect on her relationship with the doctor? The sexual aspect, his taking advantage of her? The consequences for her? For him? Personally? Professionally? For his wife? 4. The character of the doctor, his eminence, his work, laboratories, theories on hysteria, neurological theories? The discussions with his colleagues, his assistant? The plan for the Academy? The preparation, his personal relationship with Augustin? The presentation, the hypnosis? His explaining how susceptible she was? The interest of the audience? Augustine and the authentic seizure, her capacity for feigning the seizure? The performance at the Academy? The hesitation, their applause, Charcot and his future, financial support, medical work, reputation? 5. The background of his home life, his relationship with his wife, her being at home, somewhat estranged, yet supportive, her wariness about Augustine? 6. A French glimpse into aspects of French medical history?